If you live on Briarcliff Road near the Northlake Mall, you may have been awakened last night/early this morning by work crews who were paving Briarcliff Road. I had not received any notice that this work would be occurring - let alone the fact that it would be at night. There was no explanation as to why notice was not given to the residents in this area. I implored them to give notice and I was informed that GDOT will work with the contractor and DeKalb County to notify the impacted residents about the paving schedule. I'm sending this alert to help spread the word. I also suggested to GDOT that they make a contact available to the community, publish a webpage with information, and place flyers on the doors of impacted residential neighborhoods the day before the paving is scheduled to take place. I will share these with you when they become available. The plan is to pave down to N. Druid Hills Road, turn around, and pave the other side of the street back to Henderson Mill Road. The same sequence will then be repeated to place the surface asphalt. The entire paving operation should take approximately 30 working days. WHY IS THE WORK BEING DONE LATE AT NIGHT/EARLY IN THE MORNING? The contract requires the work be performed from Monday through Friday from 9 PM until 5AM because of the heavy traffic on Briarcliff. I asked if this could be moved to the daytime and was told it could not without re-pricing the contract. IS THERE ANY WAY TO LIMIT THE NOISE? GDOT told me that the work crews will be directed to hold noise down to a minimum. That said, there is still noise involved with paving and it can be very disruptive. 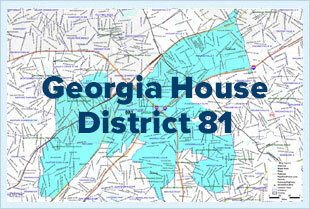 We reside in GDOT District 7. The contact info on the GDOT webpage is here.